Early this morning as I sat at the computer to write my post for today I was in a dilemma whether to write about Children’s Day which is being celebrated today in India or about the shock that the PM Narendra Modi gave the whole nation on Tuesday 8th November 2016 at around 9p.m. My blog being also a sort of diary for me about important events and personal happenings, the issue on demonetisation won. As usual I was busy watching my Indian series when I noticed on my mobile that our apartment block group going a bit crazy. Checked the first message and read that from midnight all 500 and 1000 rupees notes will be banned. My first reaction was ‘is someone sending out a joke or what?’ Then a few seconds later hubby dear calls from Mombasa to ask what’s happening. That’s when I knew that it was not a joke. I asked him to put the phone down and immediately switched to the news channel. I sat there wide eyed as Modiji made the announcement. Wide eyed not because I’m sitting on any unexplained source of money but because of the million thoughts per second going on in my head. I just exchanged all the dollars for rupees which is all in 1000s. I only have 400/- legal tender in my purse. How are we going to pay for all the wedding preparations. This was obviously my initial state of shock. I Facetimed hubby and he patiently heard all the ranting and raving. Finally, after that, the mind started working as to what has to be done once the banks open. 6 days later, I still am short of cash as the ATMs are not functioning and the ones that are, are quickly run out of cash. The queues at the banks are very very long. My daughter and I stood in the queue for nearly an hour to get Rs. 4000 each exchanged on the first day. As many taxis are still not on the Paytm system, we had no choice but to pay cash. The vegetable vendors comes everyday to our apartment and they are not as busy as they use to be before as many residents do not have cash to pay for the fruits and vegetables. I feel bad for them. I had to go and shop for my veggies at a supermarket as they accept payment by card. I have stopped giving clothes for ironing as I don’t have cash to give to the man who irons. I didn’t buy my favourite cup of filter coffee as I wanted to save on my short supply of cash. My maid was worried what will happen to her money. I advised her to get some exchanged for cash and deposit the rest in an account. Her biggest worries that she doesn’t have an account. If she puts it in her son’s account, will he give it back to her? So, I had to advise her that she should open an account in her name. I gave her some time off so she could get all this sorted out. We will have to go out later and check how the bank situations are and try and draw some cash. All these changes are for the positive, no doubt. Till then we all have to tide over all these minor difficulties and hopefully things will be on track as soon as possible. But till that happens lets talk about enchiladas. You may wonder why I’ve jumped to a totally unrelated topic; well, that’s what our 66th theme was for #FoodieMonday#Bloghop. I nearly didn’t do the challenge as I was wondering how I’m going to get my veggies. I stood in my dhobi area and looked down at all the fresh produce displayed out by the vendor and thought… ‘so near and yet so far’. Then, I saw a Big Basket van and immediately registered on it and got my fresh supply. Yes, I felt really guilty that I was not able to support the vendor who is sitting in the sun trying to sell the fresh produce. I decided to stuff my enchiladas with paneer, mushrooms and spinach and I made a Ranchero sauce and homemade taco seasoning. Usually ranchero sauce is used to top breakfast enchiladas but I love the taste of it so decided to use it on my paneer mushroom enchiladas. So here’s the recipe, all home made right from the tortilla to the seasoning. Mix all the ingredients and keep it the side till required. Sift the flours, salt, cumin powder and baking powder into a big bowl. Add little by little the warm water and form a soft dough. It should not stick to your fingers and it shouldn’t be hard. Depending on the maize flour, you may require water that is anywhere between half a cup to three quarter. Roll each part into a ball and cover with the damp cloth. Take one ball, coat it flour and roll it into a circle of nearly 7″ diameter. If it sticks, dust more flour. Cook the tortilla on till bubbles appear. Flip it over and cook till you so see tiny brown specks. Place it on a cloth and cover it with the cloth. Repeat steps 5-9 with the remaining dough. Add the onions and chopped pepper and stir fry till they become a bit soft. Add the chopped tomato and tomato puree. Take the pan off the heat and add salt, seasoning, jalapeño and chopped coriander. Add paneer and stir fry till its light brown. Remove the paneer from the pan using a slotted spoon. Add garlic and saute for a few seconds. Add mushrooms and stir fry till they become a little soft. Add the spinach and cook till it just wilts. Take the pan off the heat. Let the mixture cool down a bit. Add salt,seasoning, paneer and the chopped spring onion. Take a baking dish and smear some sauce over the bottom. Take a tortilla and put some filling in the middle. Cover it with the two end flaps. Place it in the baking tray with the seam side down. Repeat steps 3 and 4 with the remaining tortilla and filling. Cover the filled tortillas with sauce. Sprinkle grated cheese over it. Bake in the oven for 15-20 minutes or till the cheese melts. 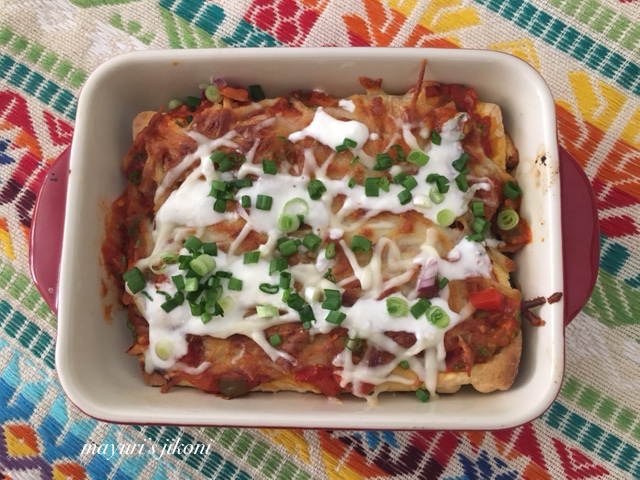 Serve enchiladas topped with sour cream and chopped spring onion. 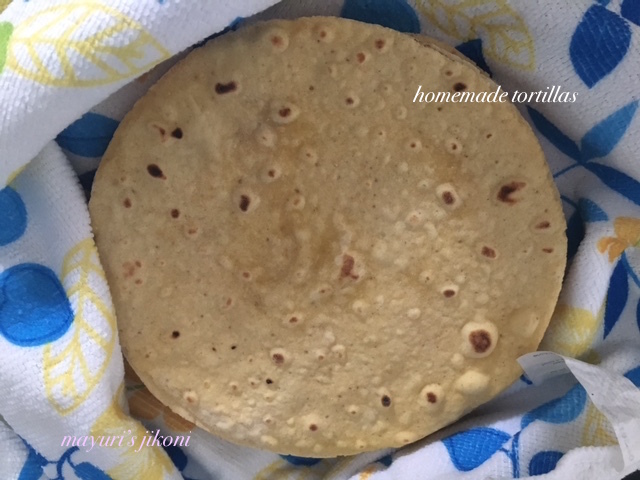 The home made tortilla came out fine,not too soft or chewy. It did not become soggy on baking. I prefer to make the sauce thick so that when the enchiladas are baked the water from the sauce does not make it soggy. I love serving enchiladas with chopped avocados but I didn’t get any. I didn’t get sour cream so I whipped a bit of fresh cream with lemon. Use a filling of your choice and make a sauce of your choice. Awesome share Mayuri. Enchiladas looks super delicious. Great share!! Love this fusion combination of ingredients.. Nothing can beat the home made sauce and seasoning.Love the recipe of seasoning.Will try soon.Lovely share.